Hand knit in Bolivia. Each sweater is unique. 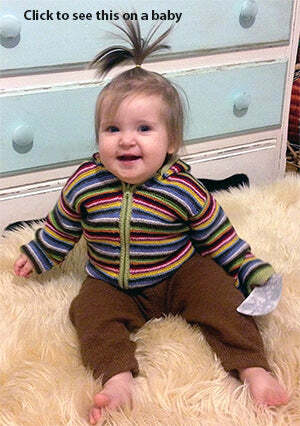 This beautiful sweater is natural, eco-friendly, hypo-allergenic and cuddly soft. Alpaca wool is both softer and warmer than sheep's wool. It is more durable, too. You don't have to be as careful with it as you do merino wool when washing it, but we do still recommend hand washing it, should it need washing. 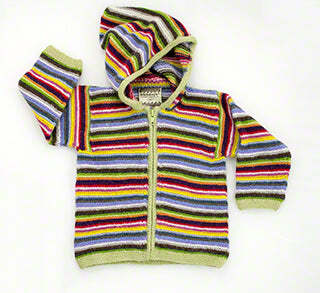 This lovely multi-color striped sweater has a zipper and a hood. It is generously sized. Do not size-up. Baby will love it and be very comfortable in it. Hand knit (really hand knit on knitting needles) in Bolivia. Each sweater is unique. Kusikuy is a small eco-ethical business who's mission is to preserve indigenous culture and improve local economies in rural Bolivian communities by providing cozy soft, super warm, high quality, hand made alpaca knitwear. Kusikuy is known for high quality, fair trade, handmade alpaca knits from Bolivia since 1997. 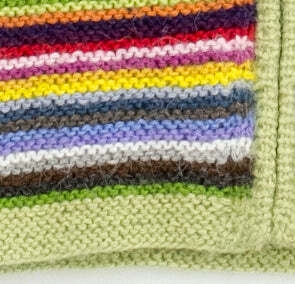 This beautiful sweater is natural, eco-friendly, hypo-allergenic and cuddly soft. Please wash by hand. Find beautiful alpaca pants to make the set! This sweater is amazing! It matches all of my son's woolie pants, it's warm, soft and cozy. I wish I had purchased it in every size when they were in stock. Runs generous/true to size. We always size up but it's not necessary. Still fits my average sized 18 month old (we have 12 month size) but we will outgrow it by the time the weather warms up. If you're on the fence, get it and you won't regret it. This sweater is so cute, and so soft, and well made! This sweater is so cute, and so soft, and well made! A little bit pricey, but it is very high quality, definitely can be passed down over and over, its the first sweater we grab so it is getting used and still looks phenomenal! True to size, i have size 12 months and it fits my 1 yr old great with room to grow. Only dissapointment is it doesn't come in my size!